Let me start off by saying that I’m just as addicted to pinterest as everyone else seems to be. But I tend to mostly look at food while on there. I look at a lot of recipes but rarely write anything down, as I’ve found a lot of them use prepackaged ingredients or have too much fat in them. 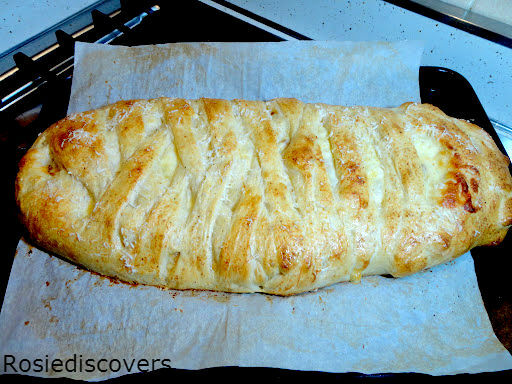 Recently I came across this recipe on the Rhodes Bread blog which used Rhodes frozen bread dough. I’m not a big fan of Rhodes bread dough because it always comes out soft and mushy when you bake it. I decided to make my own bread dough, because everything is easy with the bread machine. I also increased the spaghetti sauce, added 1/2 lb ground beef, used different cheese, an entire egg and garlic powder. Phew! That’s a lot more changes than I thought I’d made. Adding the garlic powder to the outside made it taste like the spaghetti was encased in garlic bread fresh from the oven. It turned out really well, everyone liked it. Mine did expand a lot in the oven though. Roll risen bread dough on parchment paper to 12-16 inches. Cover with plastic wrap and let rest 10-15 minutes. Cook pasta and drain. Meanwhile, brown ground beef in saucepan. When browned, drain and add minced garlic, stirring till fragrant, about 30 seconds. Add 2 cups spaghetti sauce, allow to come to a boil. Remove from heat. Stir in spaghetti, then place mix lengthwise down the dough from top to bottom in a 4 inch wide strip. Cover with shredded cheese. Make cuts 1 1/2 inches apart on sides of dough with in 1/2 inch of the filling. Begin braid by folding up top and bottom strips towards filling. Then braid left over right, right over left. Finish by pulling last strip over and tucking under. Place on baking sheet. Brush with egg wash and sprinkle with Parmesan and garlic powder. Bake at 350 degrees for 25 minutes. Slice and serve. Susie Savors: You can’t go wrong with a one dish meal. This is spaghetti and garlic bread all in one bite. 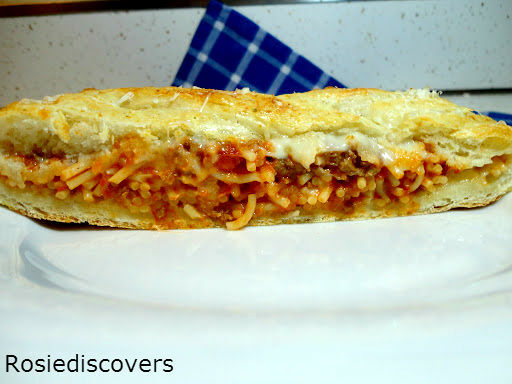 The bread to spaghetti ratio is just right, not too dry and not too juicy. The outside is crusty especially with an extra layer of cheese while the inside is gooey. Easy to make and this giant hot pocket will deliver the goods. Overall, a new family favorite because food tastes better inside a fresh loaf of bread!